April started off big with four story acceptances in the first week and now has ended on an upbeat with three new poems taken, this time all by the same publication. AMATERASU is an upcoming fantasy anthology (fiction and poetry) with a difference, that all profits will go to the Red Cross to aid Japan’s earthquake and tsunami victims. The poems in question are “Lonely Zombie” (depicting the plight of, well, just that), “Oops!” (recounting the story of Jekyll and Hyde), and “Ways to Attract a Cat” (advice for the discerning witch). More information on the anthology will appear here as it becomes available. As for the name, AMATERASU (“Shining Heaven” or “She who shines in the heavens”) is the Japanese Shinto sun goddess, a central figure in the Shinto pantheon. At one time, according to legend, the storm god Susanowa’s ravaging caused her to take refuge in a cave until, finally lured back out, she reassumed her place in the sky and brought light back to Earth. The picture here is from the Wikipedia Commons and depicts her emergence from the cave bringing with her the streak of light now known as the dawn. Sometimes also rendered Ama Terasu, according to ENCYCLOPEDIA MYTHICA, her name is pronounced ah’-mah-tay-rah-soo. Well, it’s kind of silly, but fun too, which is the point. On a list I subscribe to, Sally Franklin Christie, a.k.a. Sally the Writer/ Reader, is running a contest for April on whether readers prefer traditional printed-on-paper books or electronic books. So why not give it a try (you don’t have to be on the “list I subscribe to,” anyone can enter)? The prize is an Amazon gift coupon — not too shabby — usable presumably for either Kindle or “dead tree,” and the contest closes on April 30th. All you have to do is check out Sally’s blog and submit your answer in the Comments section. 24 comments to April Contest 2011 – What is Your Preferred Reading Format? Well, let’s see. If I’m reading in the bathtub and drop the book, I lose the book (or at least have to dry it, and even then the pages are crinkled); if I drop the ebook reader chances are I’ve lost the reader, but does it carry enough of a current that I’d also lose me? Outside the bathtub, I really prefer a printed book, but there is an advantage with the e-reader if where I am is poorly lighted. For vacations, too, there’s an advantage in packing many books into a reader, but the serendipitous thrill of going into a bookstore one’s never been in before and chancing upon a fascinating piece of absolute trash (hey, I said we’re on vacation) is, sadly, no longer there. A friend asked about this. I saw the American (George Clooney) version of SOLARIS Tuesday and was moved to reacquaint myself with the Russian version to compare them. Like films like ANDROID or SILENT RUNNING or MOON, it is for the most part confined to a closed environment, in this case a satellite around Solaris, a possibly sentient planet (the Russian version suggests it may be a sea on the planet), and hence is relatively long on thought and short on action. The Russian gives a better idea of what Solaris is at the beginning, but it’s also (at about 2 hours, 50 minutes) nearly twice as long as the American. Perhaps oddly though, once I was into it, the Russian seemed to move along faster, possibly because the American made greater use of sometimes confusing flashbacks to the protagonist’s past life (although allowing more variety of sets). Visually, the “outdoor” shots of Solaris in the American film are stunning, one early on (approaching the satellite for the first time) reminiscent of 2001: A SPACE ODYSSEY, and the ending of the American seemed at first more satisfying, if in a facile way (i.e., is Solaris Heaven?). Both concern redemption/reconciliation with the American stressing the romance between protag and his (previously dead, now recreated) wife ending with him getting what he seemingly wants, the Russian seeming to dwell more on reconciliation with one’s self and the past and becoming comfortable with what one is — the Russian protag doesn’t know at the end if wifey will join him again and rather doubts it, yet it is clear he has in some sense come “home.” Perhaps the American wants to stress the personal “Heaven” in a Christian sense (I haven’t read Stanislaw Lem’s novel, but will note he was Polish, not Russian, so the interpretation isn’t inconceivable) while the Russian seems more philosophically oriented — whatever one may read into the ending, it’s clearly a creation of the planet (allegedly director Andrei Tarkovsky was under pressure from the Soviet censors to downplay any concept of God; also, re. 2001 reference above, Tarkovsky disliked Kubrick’s film as being too coldly technology-oriented and wanted to take SOLARIS in an opposite direction). I think also in the Russian version the protag is a lot more savvy about what’s going on, more obviously accepting that “wife” isn’t his real wife but a construct from his memories, for instance, when he tells her he loves her but didn’t really love his original wife. (As opposed to the American where it seems the protag knows it intellectually but not “in his heart” — but then that’s the Russians for you 🙂 ) One odd little bit, in the Russian version the protag, when he’s in bed on the satellite, wears monogrammed pajamas. It may just be me, but this seemed incongruous enough to be funny. The photography in both the films is quite good though, all things considered, I think I may like the Russian better (monogrammed PJs or not). The poems and stories in this special issue have been donated by author and poet alumni (in my case the story “Waxworms” in the July-Sept. 2003 issue and a poem “The Madwoman of Pontneuf” in April 2001) and readers are asked to pitch in as well to help restore lost funding. So read, enjoy, and should the spirit so move check out the button to the right of the poem (beneath the thermometer). A relatively quiet last few days. On the 13th I finished drafting a story I’d been collaborating on with another writer — no zombies in this one, though we’re kicking around an idea for another that might, sort of. Then worked on changes the next day or two but, the last two days being rainy and gloomy, cat Wednesday and I have been relaxing for the most part. Last night instead of watching a DVD I decided to see what the cable company had “On Demand” in their free movie area and ran across a sort of interesting one, ZOMBIES OF MASS DESTRUCTION. These were like the original NIGHT OF THE LIVING DEAD zombies (although the movie is played for comedy), flesh-eating shamblers whose bite infects the victim turning him/her into a zombie too (a slow process involving eyes starting to bulge out — think Peter Lorre — and successive darker and more disgusting layers of makeup), in this case caused by a disease introduced by Evil Mideastern Terrorists. Fortunately (or through terrorist bad planning?) the affected town is on an island, allowing for easy quarantine, with a selection of semi-stereotyped denizens including: buxom, dark-haired college girl Frida whose father came to America from Iran; the neighbor family headed by a redneck who a) keeps calling Frida an Iraqi, b) when they’re holed up in his basement and the TV announces the Mid-East connection, immediately ties her to a chair and when she protests that she’s a born American tests her by making her answer questions and sing the Star Spangled Banner (of which she gets all the words right, which he says is more than most high schoolers could do, concluding that therefore she must be an enemy agent because they would have made her memorize them), and c) prepare to torture her because that’s what “real Americans” are supposed to do; Frida’s over-strict father; her would-be rock artist/composer boyfriend (the complete orchestral version of his song “Frida” is played over the closing credits); two gay guys who’ve come to visit gay guy #1’s mother because gay guy #2 insists it’s time for #1 to come out of the closet and confess their love; a pro-business conservative mayor and a wishy-washy liberal schoolteacher-and-disliker-of-guns who’s running against him in the upcoming election; a well-meaning but zealous minister who keeps a cure-people-of-gayness machine in his church. Some survive, most do not, and after — did they say it was “28 days”? — the disease, if not guns, clubs, knives, some kind of power tool, etc., has killed off all the zombies, the military decrees the survivors clean and the quarantine lifted, and everyone parties at the first annual we survived the zombies festival. What fun! Actually it is fun and, while it’s not on my list of DVDs to buy, if it should pop up on your TV I recommend giving it a look. (Prepare plenty of snacks to enjoy while the zombies make their own snacks of the local populace — it’s one of those that have gore effects but do a good job of making them comic). I just got word that my poem “If Only People Weren’t Made Out of Meat” should be up on ChiZine next Monday, the 18th. They tell me it probably will go up about noon, so if the subject intrigues give them a try that afternoon. Also if you’re not familiar with ChiZine, it’s a pretty nice horror ezine and, in my opinion, well worth sampling even without me. This will be part of the third weekly posting in ChiZine’s special “Mega- Issue” (cf. below, Apr. 2), a full portion of stories and poems, plus a few other features, every Monday to the end of June. Normally coming out twice a year, the accelerated pace this spring is part of a promotion following the loss of part of their funding, with content donated by authors and poets who have appeared on their pages in the past, so if you’d like to help keep ChiZine going there’s an opportunity to do so on their website as well. “Charmingly Vulgar” is one way Yard Dog Books might be described. The ones that I’ve appeared in anyway. Yard Dog is a small, iconoclastic publisher located in Alma, Arkansas with a Southern twang and a splash of barbecue sauce — a downscale brand of the latter. Yard Dog comes to mind since I’m about to be off to the bank with my latest royalty check from them. It isn’t a large one, but every six months a new check appears, a pleasant surprise sometimes when other news hasn’t been so good. In my case, I’ve had work in four zombie anthologies, BUBBAS OF THE APOCALYPSE, THE FOUR BUBBAS OF THE APOCALYPSE (where my story, “Bubba and the Amazing Technicolor Dream Fart,” leads off the “Flatulence” section), INTERNATIONAL HOUSE OF BUBBAS, and HOUSTON: WE’VE GOT BUBBAS! (I also have a non-royalty entry in FLUSH FICTION, ultra short stories suitable for reading on . . . well you know what). Humorous, serious, not always vulgar but usually down to earth, Yard Dog Press is, in my opinion, worth looking into both for readers and writers. Then today an original story, “Waiting for Geoffrey,” has been accepted for issue 5 of UNTIED SHOELACES OF THE MIND, out later this year. For those not in the know, this is a quirky, and very selective, ezine well worth a look, and not just because I also have stories in issues 1 and 3. Allow me to recommend, however, checking below for Dec. 23 for a direct link to “The Christmas Vulture,” or if you prefer just click above for the current issue. What fictional character might I date (and why would formal dress be preferred)? Did I honestly write a story called “The Dripping Nose that Wouldn’t Wipe” (and if I did, who would publish the thing)? Why is real estate writing significant? Kelly asks, I answer the questions in this latest interview on Beacon News — News of the Net for April 5. You know, these things are fun. If any other bloggers out there would like to interview me, drop me a line, perhaps on FaceBook or check out my profile there. Of course comments here or on Beacon News are welcome as well. Whoo-ey! So I saw the email from DAILY SCIENCE FICTION and, in that it omitted the title of the story du jour, I naturally assumed that meant it was just the monthly rejection. But, boy, did wily editors “Jonathan & Michele” have a surprise in store for me. After an unblemished run of ten rejections, they finally accepted one! The story accepted is “Killer Pot,” a sophisticated if somewhat cracked tale of a woman who has had herself “silvered,” and if it proves anything, it shows that persistence can sometimes pay off. (Some might add, of course, that assiduously reading every story every day and studying what the editors seem to like may have had something to do with it too.) DAILY SCIENCE FICTION is free to anyone who wants to sign up and, for a generally brief daily fix of speculative fiction, I’d recommend doing so now at their website. Then, to make it a twosome, editors Silvia Moreno-Garcia and Paula R. Stiles sent me an acceptance for my story “Victorians” for their upcoming Gothic fiction anthology CANDLE IN THE ATTIC WINDOW. Old family secrets, memories repressed, a lofty Queen Anne mansion with pinnacles rising above the river fog. . . . “Victorians” has appeared before in the 1997 Tor Books anthology GOTHIC GHOSTS as well as my own collection STRANGE MISTRESSES but, in my opinion, ages well. 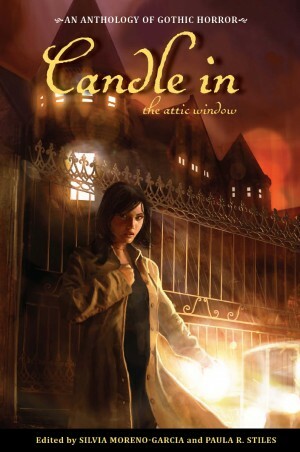 More information on CANDLE IN THE ATTIC WINDOW is available from the publisher, Innsmouth Free Press.